Donors who have included United Way in their estate plans are recognized as members of the Legacy Society. Through bequests, life insurance, charitable trusts, or retirement benefits, donors of all walks of life at all income levels can make an investment in United Way's future. Estate gifts are invested in United Way’s board-designated endowment fund. Distributions from the endowment are used as needed to support the work of United Way. Other endowment funds can be created for a specific purpose with a gift of $25,000 or more. If you are a professional financial advisor looking for more information about the Legacy Society, please visit our professional advisors resource page. Bequests: Name United Way as a beneficiary in your will – A bequest provision can be included in your will when you create it, or you can amend an existing will. Outright Gifts: Make an outright gift of cash, appreciated stock or personal assets – This is an excellent technique for individuals who are looking to benefit from an immediate tax deduction, possibly from a significant bonus or selling a business. Retirement Plan: Name United Way as a beneficiary of a retirement plan or IRA account – Perpetuating your gift through a retirement plan is simple, flexible and can have significant tax benefits. 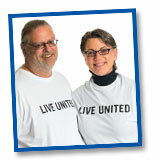 Contact the administrator of your retirement plan to designate United Way as a beneficiary. Life Insurance: Name United Way as a beneficiary of an existing or new life insurance policy – Consider assigning ownership of the policy to United Way for immediate tax benefits, or simply designate United Way as the beneficiary to leave a lasting legacy in our community. Other Ways to Give: There are many other ways an estate gift may be made to United Way, including Charitable Trusts and Charitable Gift Annuities. Please contact your financial advisor to determine the best planned giving plan for you. For more information or contact Jeriah Ebling via email or at 414.263.8156. I give generously and regularly, I volunteer whenever and wherever I can, and I tell everyone who will listen about the myriad ways the United Way positively impacts the communities it serves.